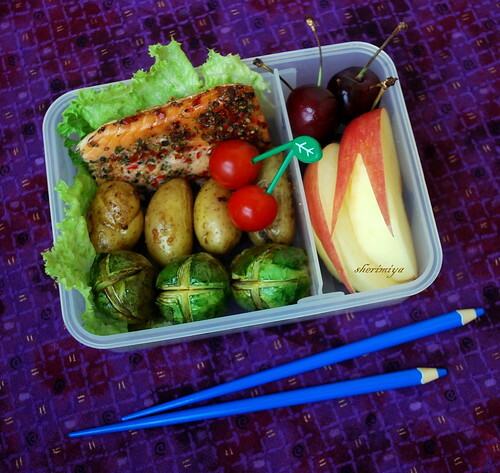 Roasted Salmon 'n Stuff Bento, originally uploaded by sherimiya ♥. Here's a roasted salmon, and yes those are chili flakes. MisterMan ate some kimchi over the break, and I am hoping it means his taste buds are becoming more tolerant of the spicy stuff ('cuz his dad & I LOVE spicy!). He ate it for dinner, and didn't say anything about it, so I'm gonna try more hot stuff too. Yippee! I also threw some garlic powdered fingerling potatoes in the pan along with some balsamic vinegared brussels sprouts. Tossed with olive oil and left for about 20 minutes. I'm another one who often makes the whole meal in the toaster oven; it's sooo convenient, and you often don't need to add much to the vegetables when you cook this way, retaining their healthful qualities. And those cool pencil chopsticks! I have to say Thank You to gamene, for sending them to me as a sweet new year's surprise waiting for me in the mail just today! Happy New Year, friends. Are you resolving to make more bento this year? i'm loving the play between the cherries and the tomato "cherries," and glad to hear there are other toaster roasters out there!! u are back, great. nice box and those brussel sprouts do look good. Thanks megan! Toaster roasters unite! 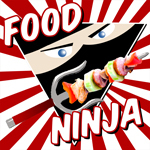 The chopsticks are great! Glad to see you back.. hope you had a nice visit with your family! Looks delicious! The pencil chopsticks are so cute too! A yummy roaster bento! Truly lush and gorgeous tones and textures here with beautiful salmon, sprouts and potatoes playing off those amazing ultra-violets and blues. Bento love. Beautiful salmon bento and those brussels sprouts are perfectly roasted!! I am a spicy food lover too, luckily my hubby shares similar tastes. :) It's great to see all of your lovely bentos again! Thanks Angi, we had a great time! Hi Rachel... yeah, I know!! Hi Lia, you're so sweet!! Thanks for your always kind words. I appreciate it a lot! !